Mac and cheese is practically the universal comfort food, a dish that has a special place in people’s hearts, and it sure does here at my house. There are so many variations of it, the possibilities are endless! The way we like ours is by adding a Mexican twist to it. It creates not only a harmony of textures in your mouth, but also a melody of flavors! It all starts with a classic elbow macaroni that cooked just under done or al dente because it’ll finish cooking in the oven. The cheese sauce is really just original and simple one that starts with the rue and then the milk and cheese. We prefer using sharp cheddar and parmesan because the taste of the cheddar really cuts through and compliments the richness of the parmesan. The result is the most nostalgic and creamy mac and cheese base that is so velvety and gorgeous! And, finally for the amazing toppings, we finish it off with homemade guacamole, pico de gallo salsa with pineapples, sour cream, and some infused breadcrumbs. The guacamole adds a really nice, almost creamier texture to the dish with some needed freshness. The salsa makes for this mouthwatering contrast of flavor with the cheese and its own tang. Now, the really interesting thing about the breadcrumbs is that they’ve been mixed with a bit of taco seasoning so they add a smoky heat to the dish, along with its crunch! And there you have mac and cheese the way our family does it! It makes a perfect weeknight meal, once in a while of course, and really puts a smile on everyone’s faces. Because that’s that truth about mac and cheese, no matter what variations of it there are, it really is a timeless dish. 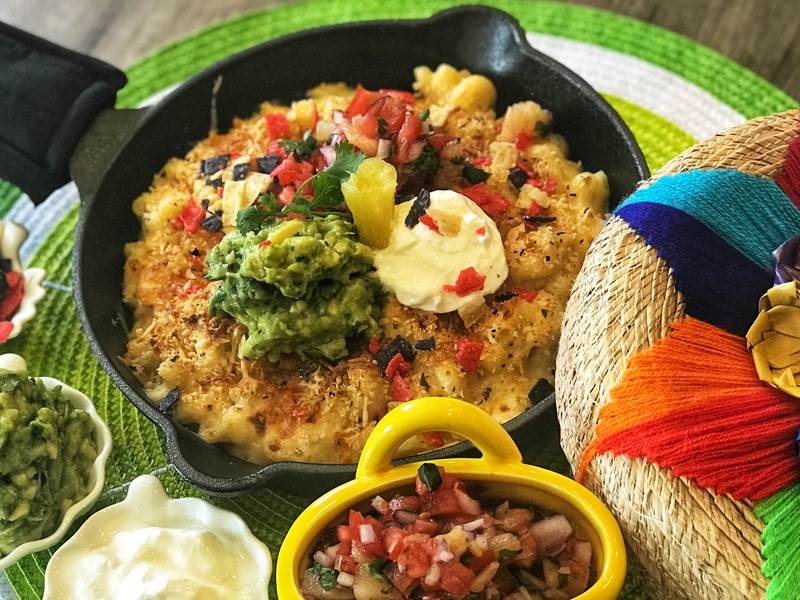 Mac 'n Cheese, the way our family likes it; with a Mexican twist - baked with guacamole, pineapple pico de gallo, sour cream and topped with infused breadcrumbs! Preheat the oven to 350oF / 175oC. Boil some water with some salt in a large sauce pan and add the macaroni to it, once it starts boiling. Cook it al dente, because it will finish cooking in the oven. Let the pasta cool. Create a roux in a large saucepan by melting some butter and adding oil and flour. Whisk it until it becomes light brown and frothy. Gradually add the milk and whisk it so no lumps form. Add in the salt, sugar, and black pepper. Keep stirring the sauce until it coats the back of the spoon. Gradually add in the cheese and stir it so no lumps form. Mix in the macaroni. Put the Mac and Cheese in a cast iron skillet and top it off with the bread crumb mixture. Bake it for 10 minutes and then broil for a few minutes, until breadcrumbs are golden. For the guacamole mix together mashed avocados, jalapeños, cilantro, salt, and lemon. For the pico de gallo, mix together pineapple, tomatoes, cilantro, onions, jalapeños, hot sauce, oregano, salt, and lemon. Take the Mac and Cheese out of the oven and top it with the guacamole, pico de gallo, sour cream, and some crushed tortilla chips. Use panko breadcrumbs as they are larger and create a nice crunchy topping. I used a hand mixer to get rid of lumps while making the cheese sauce. I have used 2% milk, but you can use whole milk to make rich and creamy. just awesome. I really enjoy the recipe. Your blog-post show your hardwork and dedication about Food. You are a true foodie. I hope too soon see you on my blog. Here is the link of my latest post Kesar Kaju Badam Pista Burfi https://theamazingguide.com/2018/08/05/kesar-kaju-badam-pista-yummy-indian-dessert-burfi-recipe/ I hope you will enjoy the dessert. I will soon visit again on your blog. Thanks. Thank you! Your blog looks fantastic!